Since the launch of the NHS Institute’s ‘Productive Ward programme’, CDP has worked closely with several NHS Trusts designing tools that draw on ‘Lean Thinking concepts’ and the ‘Three-Second Visualisation’ rule. The objective is to make patient/resident information clear and easily understandable for all relevant disciplines. ‘Visual management’ is used to communicate the status of an area or process within three seconds. 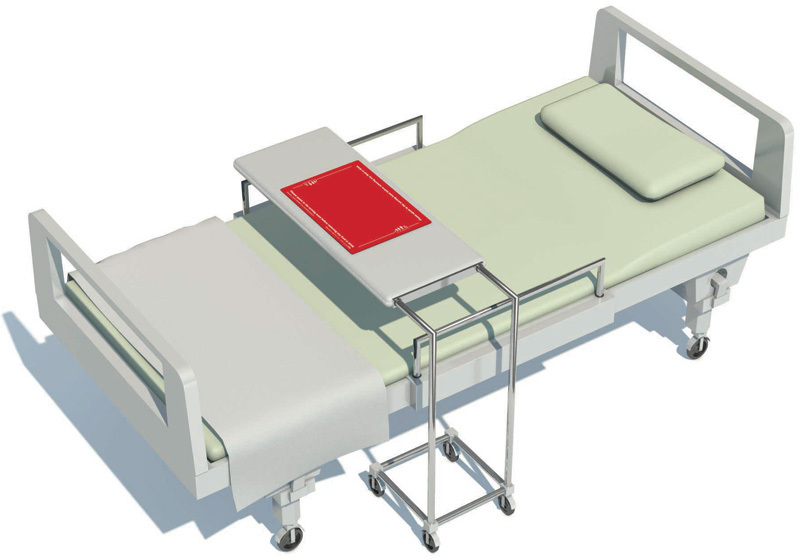 The ‘Red Mat’ is an innovative, non-slip bed table mat, which will be of interest to those caring for people within hospital settings, care homes and large residential homes. These mats support the national ‘Red Tray’ nutritional awareness concept but, unlike the conventional red tray, these are slim, easy-to-clean and designed to be left on the bed table 24/7. The result is to raise and maintain staff awareness regarding nutritional and hydration needs of individual patients. The current ‘Red Tray’ system provides an instant tool for all patients/residents that are at risk of malnutrition and dehydration. It is designed to ensure that all patients get assistance with eating and drinking. The Red Tray visually highlights to staff, that the patient/resident needs assistance and/or monitoring with food and/or fluids. When mealtime is finished support staff should not remove the Red Tray, without first checking with a member of the nursing staff. So they are only visible for short periods at mealtimes. Designed to be left on the bed table at all times 24/7 to visually highlight to staff that the patient/resident needs assistance and/or monitoring with food and/or fluids throughout the whole day. Re-assures relatives that the patient nutrition and hydration needs are being monitored. Slimmer and easier to clean than Red Trays. Excellent non-slip properties allowing good adhesion to table and other flat surfaces.